"Della was one of the first of the "Papenfuse" aunts that I..."
"Our condolences to your family. So sorry for your loss she..."
With a heavy heart we want to share with you the passing of Della Papenfuse-Wilen of Vancouver, WA on March 19th, 2018. In her 90 years Della was loved by many: her family which included her parents, husband, 6 siblings, 2 children, 3 grandchildren, and 8 great-grandchildren; many friends; and her coworkers. Della was born in Kincaid, Saskatchewan on November 18, 1927. At 17 she received a provisional certificate of teaching license and taught in a one room schoolhouse. When she was 20 she moved to the United States, began working for the telephone company, and met Robert Wilen. In June of 1948 they were married. After the birth of her first child, Della became an American Citizen. remembered for her love of family. During their life together, Bob and Della loved boating, camping, and square dancing. After retirement they enjoyed traveling all over the United States and Canada in their motorhome. She leaves behind two loving daughters, Carolyn and Debbie; son-in-law, Gary; grandchildren, Jason, Anjanette and Joshua; great-grandchildren, Ian, Riley, Mia, Delaney, Jacob, Olivia, Ava and Derek; and two loving sisters, Myrtle and Vera. Although we know she is finally at peace, she will be greatly missed. 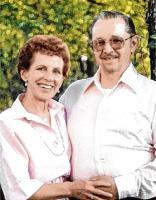 Della has been reunited in heaven with her beloved husband who she called her strength; her parents, Ola and William; and siblings, Nyla, Eva, Earl and June.